The book offers a new introduction to Jacques Derrida and to Deconstruction as an important strand of Continental Philosophy. From his early writings on phenomenology and linguistics to his later meditations on war, terrorism, and justice, Jacques Derrida (1930–2004) achieved prominence on an international scale by addressing as many different audiences as he did topics. Yet despite widespread acclamation, his work has never been considered easy. 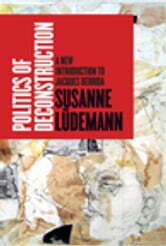 Rendering accessible debates that marked more than four decades of engagement and inquiry, Susanne Lüdemann traces connections between the philosopher's own texts and those of his many interlocutors, past and present. Unlike conventional introductions, Politics of Deconstruction offers a number of personal approaches to reading Derrida and invites readers to find their own. Emphasizing the relationship between philosophy and politics, it shows that, with Deconstruction, there is much more at stake than an "academic" discussion, for Derrida's work deals with all the burning political and intellectual challenges of our time. The author's own professional experience in both the United States and in Europe, which particularly inform her chapter on Derrida's reception in the United States, opens a unique perspective on a unique thinker, one that rewards specialists and newcomers alike.